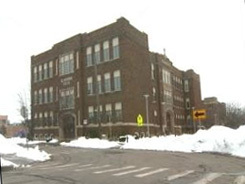 Grand Rapids first Catholic school opened in 1853, educating area students for 137 years. In the 1850s education became of foremost importance in the minds of the citizens of Grand Rapids; Catholic parents were no different. In 1853, St. Andrew’s Academy was established, but closed after only two years for lack of funds. The Catholics tried again in 1858, a small frame house on Ionia St. was donated by a parishioner, and two women taught both boys and girls until 1860 when three sisters of the Brigidine order arrived and assumed charge of the school. The sisters left in 1866 and the school closed. In the fall of 1872, ground was broken on the corner of Sheldon and Maple for a new three-story, brick school building in the Second Empire style. In September of 1873, the Sisters of Mercy, led by the formidable Mother Mary Joseph Lynch, left their convent in Brooklyn to come to St. Andrew’s. However, the school building was far from finished so the nuns held classes in a converted barn at the back of the property for the next year and a half. When the Sisters of Charity took over the school in 1877, the move from the barn into the new building had been completed. Despite fires, reconstructions, and expansions, St. Andrew’s school remained at the same location until 2010 when it graduated its last students, the 137th class. In 2011, despite organized, local protests, the city Planning Commission unanimously blessed the demolition of the building.